It seems that the day of reckoning is coming for Rob Ford, the mayor of Toronto, the fifth-biggest municipality in North America and Canada’s biggest and most influential city. The type of conservative populist who could wring electoral reward out of gaffes and controversies, Ford has been both beloved and despised for his loud, aggressive style. Ford’s run as a politician on the international stage has always had an absurd, I-can’t-believe-what-I’m-seeing quality. Whether it was his penchant for getting publicly wasted, his insistence that women who contract HIV must be sleeping with bisexual men, or his inability to perform a five step drop without falling over like a character in a slapstick comedy, Ford always seemed a little too good (or bad) to be true. But nothing could have prepared even Ford’s many critics and skeptics for the story first discussed by Gawker this past May: a video showing Ford smoking crack in a Toronto housing development. Gawker ’s editor-in-chief, John Cook, traveled to Toronto and personally witnessed the video, for which his contact wanted to charge an exorbitant sum. The story provoked a conflicted response in the mainstream media, particularly the Toronto Star — after all these years, newspapers still struggle over whether and how to respond to stories broken under the looser ethical and legal standards employed by gossip- and rumor-oriented online publications. This is not necessarily the end of Ford’s political career — the example of Marion Barry is hard to avoid in this instance — but his reign as mayor of Toronto is likely coming to an end. Ford announced that he was running for reelection despite the controversy, but given the Toronto Police Department’s apparent interest in the story, legal repercussions are likely forthcoming. The story of Rob Ford, mayor of Toronto, seems to be hurtling towards a climax — if not through a resignation, then an arrest or removal. But there are broader questions in play here. The situation is actually deeply symbolic, involving a city with a high minority population in a country with a huge white majority, a drug that has always been cast as a drug of the underclass, and a mayor whose oafish and exaggerated behavior has frequently been called “low class” — a reputation now combining uncomfortably with the cultural assumptions about the people who smoke crack cocaine. As Cook and Gawker have repeatedly noted, it is, indeed, a big deal that the mayor of a major metropolis is doing something illegal, and particularly when that something illegal is using drugs, a subject which always captures the public attention. But this story has attracted a particular kind of attention — a particularly prurient atmosphere of scandal — due to the fact that Ford used crack, a drug that is typically associated with the black underclass. Ford is not the drug-using mayor. He is the crack-smoking mayor, and the difference matters. These statistics confirm the common depiction in the media and arts of crack as a drug of the urban, minority poor and cocaine of affluent whites. Indeed: it’s precisely because a small amount of powder cocaine can be stretched into a larger amount of crack that crack became a drug of the poor in the first place. It’s why crack is a way to make a dollar out of fifteen cents. The fact that poor minority people are much more likely to use crack leads directly to a raft of myths about the drug, such as the notion that it is much more addictive than the powder variety, or that pregnant women smoking crack give birth to “crack babies,” or that it provokes uniquely violent episodes. Yet despite these objective similarities, crack and powder cocaine retain deeply divided racial and economic characters in contemporary American culture. The distinction is most pernicious and notorious in mandatory minimum laws, where possession of crack cocaine has carried a far harsher penalty than possession of powder cocaine. (The Fair Sentencing Act has reduced the disparity from a 100 times longer sentence for possessing crack in equal amounts to powder cocaine; now, the disparity is “just” eighteen times.) There can be little doubt that this difference in our legal system arose from straightforward racism and class exploitation. America’s white majority may hold its nose when it comes to the abuse of powder cocaine by white executives, but it actively fears black people who smoke crack. All of this slots very comfortably into the perception of Ford. It’s easy to mistake his reputation as a result merely of his general portly oafishness. But Ford has always had a reputation as not merely loud and obnoxious, but seedy. Low-class. And that reputation has combined, in a manner pregnant with political meaning, with the constant harping on the particular drug that Ford is accused of abusing. A photo of Ford, surrounded by black men in the poor neighborhood development where Ford is alleged to have smoked crack, has been run again and again, playing directly into the racial fears that accompany discussion of crack. Gawker itself is the best example of this. The website has made constant repetition of the particular drug its main focus and main source of humor in their posts on this story — and they’ve published dozens. Cook and Gawker have deliberately and repeatedly called attention to the fact that Ford was not only guilty of drug use but of smoking crack. What’s more, Cook ended post after post on the controversy by saying “Don’t do crack,” an explicitly moralizing admonition that has not accompanied other stories run on Gawker that mention other types of drug use. (This story on MDMA, for example, is both franker and less moralizing, and goes out of its way to consider the class implications of that drug.) Or we might consider the fact that the crowdfunding effort made by Cook to secure the video was referred to as the “Crackstarter” and which featured a photo of Ford portrayed as a pig smoking a crack pipe. I could go on. Two things are clear here: Cook and Gawker really want you to care about this story, and they really, really want you to know that Ford’s drug of choice was crack. This is, of course, a joke, the repetition designed in part to highlight the ridiculousness of the mayor of a huge city smoking crack. But why is smoking crack ridiculous in a way that snorting cocaine wouldn’t be? I highly doubt that Gawker would be constantly harping on the coke-snorting coke mayor of CokeTown who was filmed snorting coke in a cokehouse surrounded by known coke dealers. That simply lacks the click-baiting, scandalous appeal of Rob Ford, The Crack-Smoking Mayor. But even if they did, that story would not involve nearly as much over-the-top, scandalized attention as a white mayor using a drug that is disproportionately used by the black, urban poor. The simple reality of media attention is that race and class dimensions are exploited even when that exploitation is unintentional. I can’t imagine that operators as savvy as those at Gawker Media could be ignorant of the dynamics in play here. I don’t think they went out of their way to play up the racial angle, but I also don’t think they did anything to avoid it. This is a shame, given that they have written on the drug war frequently with sensitivity and a strong grasp of its inherent inequality. Gawker generally and Cook specifically deserve considerable praise for their dogged pursuit of this story. One of the central values of new media is a willingness to pursue stories considered too gossipy or sensationalist by “respectable” news organizations. Gawker has outflanked the Star in particular at every turn, seeming to confirm many criticisms of old media in doing so. But the constant repetition of the particular form of cocaine, and the refusal to locate that information in the cultural context that Cook and others at Gawker surely understand is a major omission, has to be called out. This is all particularly disappointing given the quality of Gawker’s recent work. Gawker is one of the most essential publications operating today. This value stems in large part from the left-wing politics and explicit moralism that writers like Cook, Hamilton Nolan, and Tom Scocca bring to the publication. They demonstrate a willingness to speak in straightforward terms about class and race in contemporary America that is truly rare in that strata of elite media. The value of Gawker, in other words, lies in being conscious — in thinking about culture and politics and class, and in paying attention to things like how the average reader is likely to interpret stories about prominent politicians using a drug associated with the black underclass in a housing project. I don’t think and would never say that the story of Rob Ford is not news or doesn’t deserve to be told. Nor do I think that Cook or Gawker should only be blamed for their coverage. On the contrary: he and Gawker deserve considerable praise for their tenacious reporting. But they also deserve criticism for the comprehensive thoughtlessness of their routine appeal to the base instincts of readers who will undoubtedly read race and class into Ford’s drug of choice. It is precisely in these moments of innuendo and scandal when the need to be thoughtful is most pressing, and where being thoughtful is most difficult. A publication that broke this story, pushed it into international news, and has repeatedly insisted on its importance also has the responsibility to locate it in a political and social context, to write and speak frankly about the particular dimensions of race and class in a controversy filled with them. 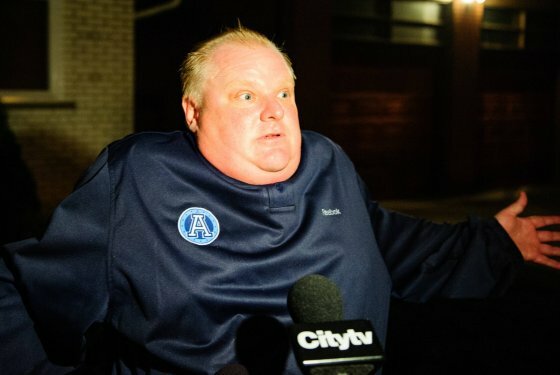 Gawker ’s harping on Rob Ford’s crack use is laced with the drug’s racial and class associations.